Mill River Brewing BBQ & Smokehouse is fighting the good fight when it comes to the environment. Always keeping sustainability in mind MRB aims to not only just recycle, reuse and compost but to reduce. Mill River Brewing, LLC is committed to protecting the environment, the health and safety of our employees, and the community in which we conduct our business. It is our policy to seek improvements throughout our business operations to lessen our impact on the local and global environment by conserving energy, water and other natural resources; reducing waste generation; recycling and purchasing environmentally preferable products; and reducing our use of toxic materials or production of toxic products and/or byproducts. We are committed to environmental excellence and pollution prevention through continual improvement and meeting or exceeding all environmental regulatory requirements. To learn more about the VT Green Brewery Cohort click here. 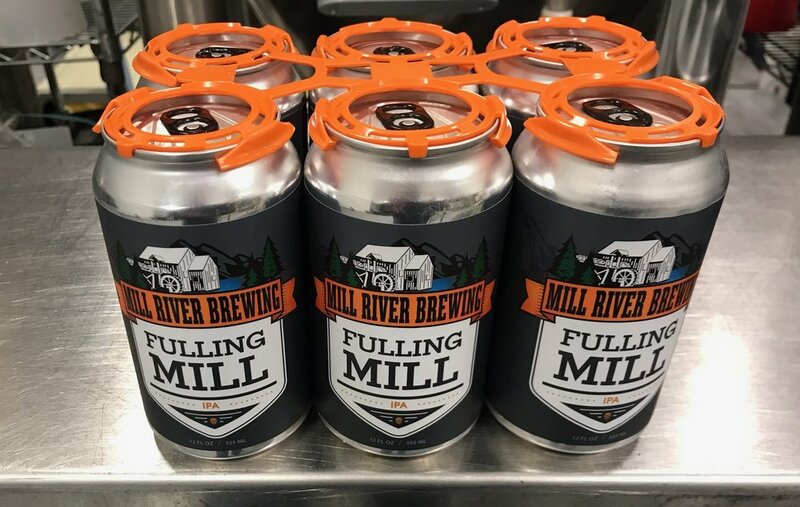 Mill River Brewing made the ethical decision to switched to these 6 pack holders in order to reduce the amount of plastic being used to hold their cans together. These holders can be re-used more than once when returned! The flight glasses are unique in look and style. Not only do they add to the captivating atmosphere in the alehouse but they’re made from recycled coke glasses. We also capture a significant amount of our brewing waste to be land applied. This helps with reducing our impact on the local wastewater facility and reduces the amount of fertilizer needed to grow crops. A strainer and collection bucket are used at the bar. Meaning soda, spirits and beer remnants aren’t dumped into our waste stream. Instead, we collect, and land apply. We took the pledge! Will you? Another way we cut back on waste is by being a Straw Upon Request establishment. Learn more by clicking here. Run chilling equipment on non-peak hours in order to reduce the demand on the electrical grid. All food scraps from the kitchen are diverted from solid waste to compost. Take out containers, straws, and to go bags are compostable. Grain bags are diverted from solid waste and donated to Salvation Farms. The grain sacks are used at the Vermont Commodity Program in Winooski. They use them to transport compost culls off our pack line to local animal farmers - pigs and goats love the slightly rotted carrots, apples and squash & the grain sacks are a great way to move this feed.